The search for a better burger is a trend that continues in restaurants, eateries, food trucks and backyards throughout the country. The creative juices among professional chefs and home cooks flow freely as the choice of bun, meat, and added ingredients pile as high as a burger lover dares to dream. But even dreamers need a solid foundation, and in the case of a hamburger, that begins with great quality ground beef. Harris Ranch is one of the most trusted brands for quality beef produced with some of the highest safety and animal welfare practices in the industry. The results give customers a consistent, juicy burger that they can feel good about eating. Earlier this year, Food & Wine magazine named the best burgers in U.S., which included Michael’s Genuine Signature Burger served at Michael’s Genuine Food and Drink in Miami, Florida. The burger there is made with Harris Ranch’s Black Angus beef, served on a brioche bun with house-smoked bacon. Recent menus from food trucks to fine dining restaurants have topped burgers with everything from avocados to zucchini, and even luxurious ingredients such as foie gras, and artisan cheeses. They are sandwiched into breads, rolls, tortillas, and even patties of fried macaroni and cheese used as buns. But the common ground for all great burgers begins with great beef. Harris Ranch has been producing the highest quality and most consistent beef possible for nearly 40 years. Not many beef companies can truly claim they control all aspects of production, but Harris Ranch has built a uniquely integrated company where they control cattle sources, feeding and humane processing. Harris Ranch’s beef cattle spend about 80% of their lives grazing on western ranch lands before being finished on a nutritionally balanced diet of corn and other feed grains, plus alfalfa hay, vitamins and minerals. This helps add tenderness, flavor and juiciness to all Harris Ranch beef products. Food safety is a top priority at Harris Ranch. Customers can cook with comfort, knowing third-party auditors and major quick service restaurants (QSRs) repeatedly give Harris Ranch exceptional marks for food safety. In fact, as an industry leader they are one of the first producers to begin final grind testing to further ensure product wholesomeness. In markets throughout the west, customers will find Harris Ranch ground beef at the meat counter, the butcher shop, and Natural Angus frozen ground beef patties and refrigerated chubs. These quality ground beef products are a great start to a better burger. For inspiration, Harris Ranch Restaurant’s executive chef, Anthony Hagans, offers his recipe for one of his favorite burgers! Heat gas grill to high or heat coals in a charcoal grill until they glow bright and ash over. Brush the burgers with canola oil and season with salt and pepper. Grill the burgers until they are golden brown and slightly charred on the one side, about 4 minutes. Flip the burgers and cook for approximately another 4 minutes (for medium rare to medium burger). 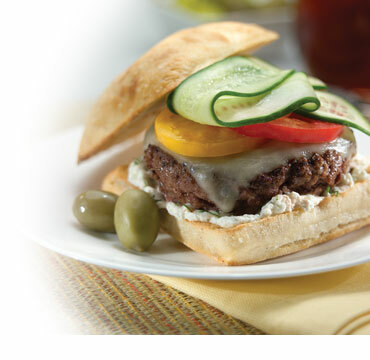 Top each burger with gorgonzola cheese and leave on the BBQ to melt for 1 minute. Remove burger and place on a plate. Spread mayonnaise on the inside of each toasted bun; place the burger on the bottom part of the bun, top with caramelized onions, pancetta bacon, roasted bell pepper and the top of the bun. Enjoy! !